It's Tax Time! 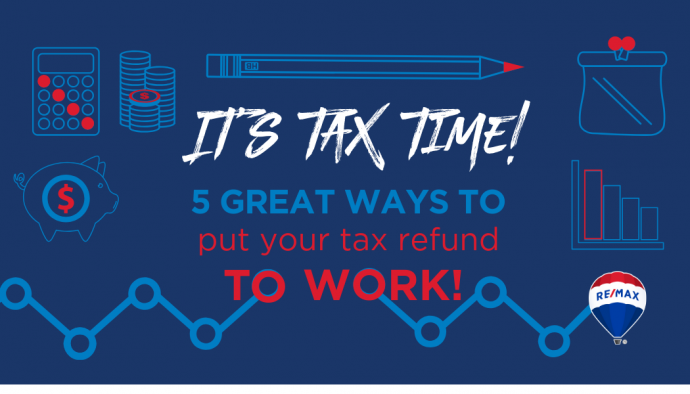 5 great ways to put your refund to work. You’ve filed your taxes (or you’re planning to very soon) and you’re expecting an income tax refund. To some, this perceived windfall can be a sign to go on a spending binge. READ MORE: How much will it cost to buy a house? Leaving that cash in a savings or chequing account makes it easy to access – and spend. Take advantage of tax savings in 2018 by depositing your 2017 refund into your Registered Retirement Savings Plan or a Tax-Free Savings Account. Depending on your mortgage terms and conditions, you may be able to make a lump-sum payment. You’ll pay less in interest and more in principal. While $1,765 may seem like a drop in the bucket, every dollar counts. If home ownership is part of your future plan, deposit your tax refund into a “down payment” fund. An RRSP is a great option. You’ll enjoy a tax break, and you can borrow up to $25,000 (tax-free!) for your down payment and other home purchase-related costs when you’re ready to buy. READ MORE: What is a down payment? Always consult your financial advisor to determine the best solution for your needs and goals. Older PostState of the Market Episode 3.2 | Key info going into the Spring 2019 Market!